Kingsley Books, an independent publisher of high-quality works of fiction and nonfiction, is pleased to announce the publication of Richard the Poorer’s (Gluten Free) Food 4 Thought. Fitzgerald stated, “Food 4 Thought offers over 850 bite-sized morsels in the form of what Ben Franklin referred to as ‘moral sentences, prudent maxims, and wise sayings." Arrogance is like a suit of armor; it makes us perfectly invulnerable until such time we need to relieve ourselves. Hope is the stirrup we use to climb into the saddle of each new day. Some poems are written; others are lived. 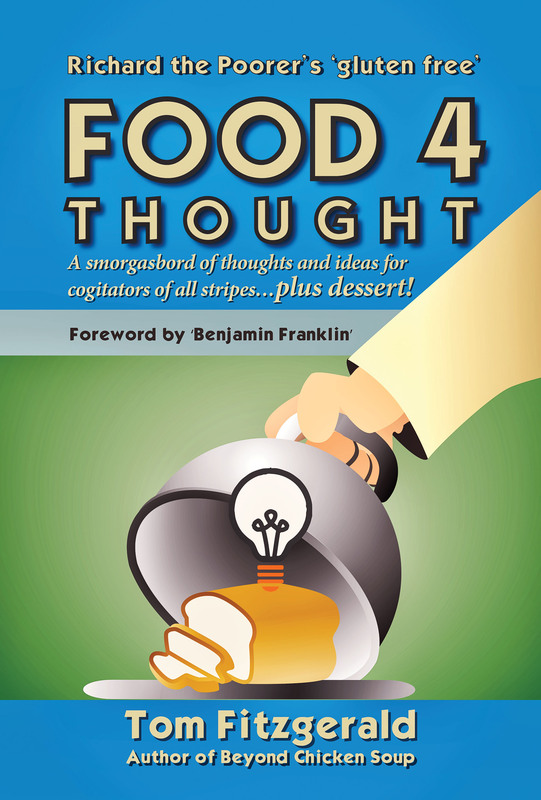 “Food 4 Thought also includes,” according to Fitzgerald, “several dozen mini-essays on a wide range of topics, from the case for courtship, to the state of manhood in America, to the pathology of the obesity epidemic." Tom Fitzgerald led a Huckleberry Finn childhood along the St. Lawrence River before undertaking formal studies in physics, mathematics, law, industrial management, and English. Tom is the author of Poor Richards Lament: A most timely tale.